— Mitt Romney on Sunday, March 6th, 2016 in an interview with NBC's "Meet the Press"
By Louis Jacobson on Sunday, March 6th, 2016 at 6:12 p.m.
Donald Trump endorses Mitt Romney for president in Las Vegas in 2012. Mitt Romney is interviewed on the March 6th edition of "Meet the Press." Mitt Romney, the 2012 Republican nominee for president, burst onto the 2016 presidential campaign on March 3, giving a speech in which he tore into Republican frontrunner Donald Trump. "Let me put it plainly: If we Republicans choose Donald Trump as our nominee, the prospects for a safe and prosperous future are greatly diminished," Romney said. Part of Romney’s speech addressed Trump’s record as a businessman. But many observers were quick to point out that Romney was singing a different tune when he accepted Trump’s endorsement early in the 2012 presidential primary season. This backstory came up when Romney appeared on the March 6 edition of NBC’s Meet the Press. "Were you just sort of saying something you had to say four years ago in order to accept his endorsement?" asked host Chuck Todd. Romney responded, "Well, Donald Trump has made a lot of money for himself. And there’s no question that he’s got a lot of money in his pockets and has been successful on that score. But if you look at his record overall … you say, ‘OK, he made a lot of money for himself, he inherited a lot of money from his dad, but this is not a guy who is a self-made man, and this is a guy who’s crushed a lot of people along the way.’ "
Then, Todd asked Romney, "Why’d you say so many things about his business career, when clearly you’re not impressed?" Romney responded, "You know, he’s made a lot of money for himself, and I’m gracious enough in a setting where someone has endorsed me to point out that he’s been successful and made a lot of money -- he has a lot of hotels and so forth. But you can’t also ignore the fact that he’s had a lot of failures." We took a look at Romney’s remarks now and in 2012 to see whether he’s flip-flopped on Trump’s business record. "But wait, you say, isn’t he a huge business success that knows what he’s talking about? No, he isn’t. His bankruptcies have crushed small businesses and the men and women who worked for them. He inherited his business, he didn’t create it. And what ever happened to Trump Airlines? How about Trump University? And then there’s Trump Magazine and Trump Vodka and Trump Steaks, and Trump Mortgage? A business genius he is not." Romney’s comments in Las Vegas are less specific than what he said in 2016 -- he never singled out specific business ventures, other than the hotel where the endorsement event was being held. Still, in 2012, Romney communicated an overall admiration for Trump’s business acumen, citing his "extraordinary ability" to understand how to create jobs "across the country." Romney even said that his own -- and not insubstantial -- business accomplishments were "not quite as successful" as Trump’s. When we contacted Romney’s camp, they urged us to review the entirety of Romney’s interviews after making his anti-Trump speech, including with NBC’s Matt Lauer, Fox Business News’ Neil Cavuto, CNN’s Gloria Borger, and Bloomberg’s Mark Halperin. Not all of these interviews addressed Romney’s views of Trump’s business skills -- in the Fox Business and Bloomberg interviews, for instance, he emphasized as a reason for his change of heart some of the things Trump has done and said during the campaign, such as his comments about Muslims and Mexicans, his criticism of former President George W. Bush and his mixed signals on condemning the Ku Klux Klan. But when Romney did address direct questions about his views on Trump’s business record, his message seemed to be that he was focusing on the positive part of Trump’s business history in 2012 and giving a more detailed, nuanced recounting in 2016. "Oh, let me tell you, this is a guy if we look at the past, this is a guy who was very successful and made a lot of money for himself," Romney said in an interview on the March 6 Fox News Sunday. "But at the same time, take a very close look and look how many small people he crushed along the way and how many failures he had." And in his interview with Lauer, Romney said, "Oh, he's a successful guy -- he's made a lot of money -- but he hasn't been uniformly successful, and he's far from a business genius. Look, Trump University, Trump steaks, Trump mortgage, Trump vitamin company. One after the other, failure after failure. So just because he's made a lot of money, one, you don't measure your life by how much money you've made, but just because he's made a lot of money doesn't mean that his economic policies are right for America." Still, we see his comments four years apart as being fundamentally different in their message. Hearing Romney’s 2012 comments, a listener would not have picked up on the notion he asserted in 2016 -- that "a business genius (Trump) is not." 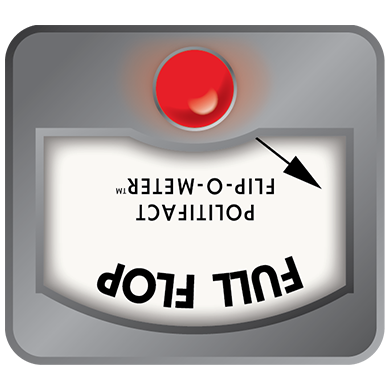 We rate Romney’s view on Trump’s business record a Full Flop. Published: Sunday, March 6th, 2016 at 6:12 p.m.